Introduction: Natural orifice transluminal endoscopic colorectal surgery is not yet ready for widespread clinical use. Meanwhile, hybrid minilaparoscopic-assisted/natural orifice approach using available laparoscopic instruments may provide patient benefits minimizing wound-related complications, postoperative pain, hospital stay and improving cosmesis. The aim of this study is to assess our initial experience with the transvaginal minilaparoscopic-assisted rectosigmoid resection. Methods: Patients were studied between April and September 2008. Data regarding demographic and clinical characteristics, surgical details, and postoperative course were prospectively entered and reviewed. Results: The operation was performed on five female patients of a mean age 67.2 (range, 56-82) years with the mean ASA score of 2.2 (range, 2-3) and the BMI of 28 (range, 20.8-29.1). Four patients had sigmoid colon or upper rectal cancer and one patient had diverticulitis. The median operative time was 304 (range, 300-321) min. No conversions, anastomotic leaks or other perioperative complications were recorded. There were no vaginal discharge or discomfort. The median hospital stay was 4.4 (range, 3-5) days and the median time to first bowel movement was 2 (range, 1-4) days. According to the Visual Analog Scale, mild or moderate pain was reported by 80% of the patients on day 1 with only one day use of narcotics. The number of identified lymph nodes and surgical margins were adequate for oncologic resection. Median follow-up was 3.5 (0.5-5) months. All patients were very satisfied with their results. 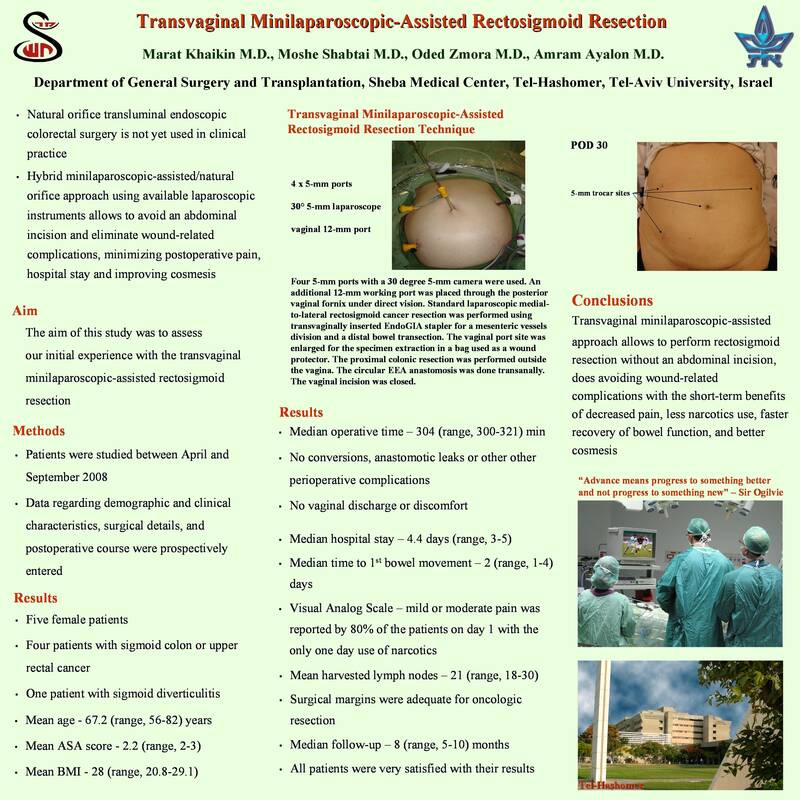 Conclusion: Transvaginal minilaparoscopic-assisted rectosigmoid resection is a satisfactory procedure minimizing the potential for incision-related complications with the short-term benefits of decreased pain, less narcotics use, faster recovery of bowel function, and better cosmesis. Further studies with longer follow-up are needed to determine the indications, the optimal technique, and the oncologic outcome of this approach.